How to reverse a number in Java? 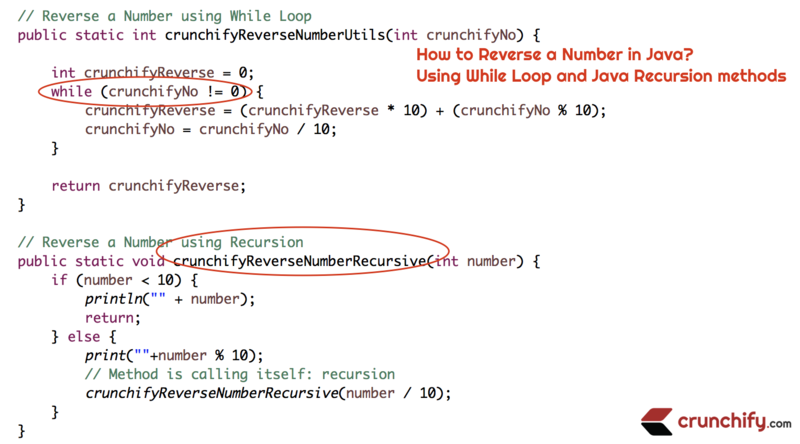 How to reverse a number in Java using Recursion method? In this tutorial we will go over all details on how to reverse a number using While Loop and Recursion Method. Logic is very simple: In each iteration of while loop, the remainder when crunchifyNo is divided by 10 is calculated and the value of crunchifyNo is reduced by times. There is another tutorial on site about How to reserve a String in Java, if you are interested. Just run above program as java application and you will see below result. As you notice in program, we are generating Random integer every time so your result might be different every time. Hope you get an idea about logic and you face any issue in Java program to reverse number. In Java8 How to Shuffle, Reverse, Copy, Rotate and Swap List using Collection APIs?